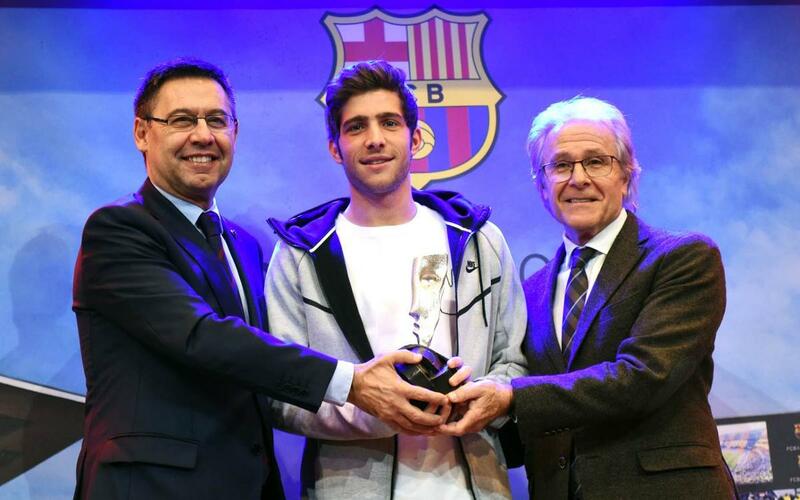 This Monday 11 December, Sergi Roberto received the 8th edition of the Barça Players Award, organised by the Barça Players Group, and given to the fairest playing member of the first team for the 2016/17 season. The award was presented by club president Josep Maria Bartomeu and the president of the Group, Ramon Alfonseda in the Auditori 1899 at the Camp Nou. The award is chosen by a committee of 18 people from the sport and journalism worlds, who this year wished to recognise Roberto’s humility and willingness to adapt to the team’s changing needs. As somebody who spent so many years as part of the club’s youth structure at La Masia, it comes as a particularly special honour to the 25-year-old, who also mentioned that the Champions League draw has pitted his team against “a very difficult opponent” in Chelsea. The event doubled as a tribute to Martí Vergés, who was at Barça from 1956 to 1966. The ex-player received an honorary posthumous award for a player who would most certainly have collected plenty of fair play awards of his own, had then existed in his days.